Poker is a great game if you want to be able to earn money from home or in a casino. When you play poker you are playing against other players. Not against the house. The only edge in poker is therefore how skilled you are as a player. If you are a skilled player who bets when the odds are in your favor then you will win money over time. There is nothing guaranteeing that you will win any one hand. But if you bet your money when the odds are in your favor then you will win money over a large amount of played hands. Luck is very important in a single hand but does have very little effect on the game in the long run. As long as you remember this and stay disciplined you will earn money. It is important to know that only proper poker games such as Texas Hold-em and Omaha hold-em give you the chance to win money if you are a skilled player. Casino poker games such as Caribbean stud poker and Casino hold-em are casino games designed to give the house an edge. They are modeled after poker games but are not proper poker games where you play against other players. You should only play proper poker games. The best type of poker to learn if you want to be able to earn a lot of money is Texas Hold-em. This is by far the most popular of all the poker games. 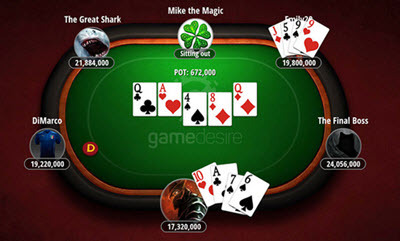 It is very easy to find poker games on and offline if you choose to play Texas Hold-em. The games popularity means that there are loads of skilled and less skilled opponents to play against. Make sure that you play at tables where most players are less skilled then you are. The money tends to flow to the most skilled players and if you play with players that are better then you then the risk is very large that you will end up losing money. Other good games to choose include 7 card stud and Omaha Hold-em. I do however always recommend that new players start playing Texas hold-em and then move on to other games if they do not like Texas Hold-em. How can I learn poker? Most poker games are rather easy to learn. This is especially true with Texas hold-em. You can learn the game in a couple of hours. To become a skilled player takes a lot longer. The rules are easy to learn. How to read people and interpreted different tells is a lot harder to learn. It is often said that poker is easy to learn but takes a lifetime to master. This is true. It will take you at-least a couple of years to become a truly skilled player. You can start earning money on low stakes tables a lot sooner than that. To become skilled enough to do that usually only take a few days to a few weeks. The best way to learn poker and quickly become a skilled player is to read Super system by Doyle Brunson. The book is almost 40 years old but remains one of the best books about poker. The book will teach you everything you need to know to get started. Combine the book with a lot of online poker. Online poker is the best way to learn playing poker. This is due to the fact that online poker allows you to play thousand of hands each night. You can get the same experience in a week playing online that would take more then a year to get in an offline poker table. After a year playing online you can have played more hands than anyone have played in their lifetime offline. This is especially true if you play on several tables at the same time. Take your time and allow yourself to become a more skilled player before you start playing with higher stakes.